Oops! In my preceding post about our adventure on the mountain yesterday, I completely forgot to write about our birding fun! By far the highlight of the birding part of the day came almost at the end of our trip around the mountain, when we were in the dense fog. We came over the top of a little bump, and both of us saw movement on our right, just 10 feet or so in front of the truck. By the time we got our eyeballs tracking on the movement, the bird we saw had landed in the tall grass about 30' from the truck. As soon as we got a good view we could see it was a pueo, an Hawai'ian owl, just like in the photo at right (which is not mine, dang it!). A few seconds later, it hopped up about three feet onto a lava outcropping – and then stayed there until we'd had our fill of watching him, perhaps 15 minutes later! While we watched he made some odd movements. One of them was very cute: it would tip it's head on the side, first one side and then the other. The other was just weird: it held its head level, but moved it in a circular pattern, as if tracing out the numbers on a clock face. We have no idea why it did that! We've seen pueos on many of our trips to Hawai'i; they're fairly common here. In fact, we had three other pueo sightings early in the day just yesterday. 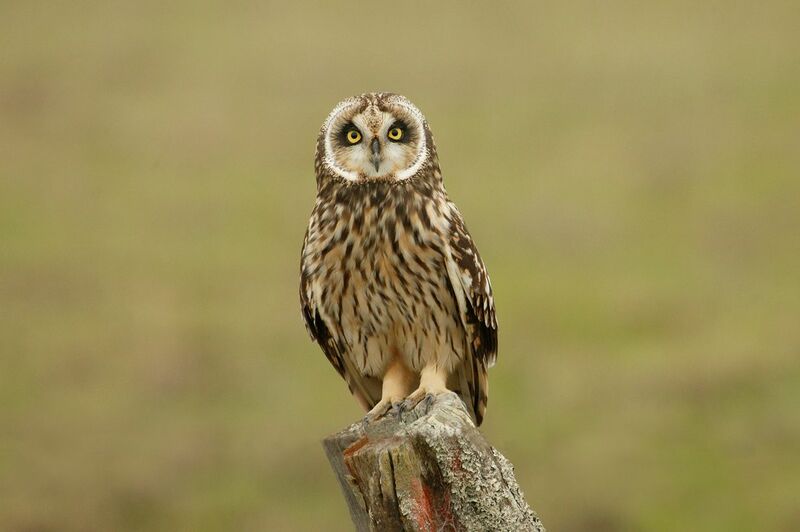 But none of those sightings were anything at all like the one yesterday – they were all brief sightings of the pueo in flight, usually hunting, and usually at a considerable remove. This pueo was between 20' and 40' from the truck (we moved the truck to get a closer view after we'd watched for a while). With the binoculars, our view was so good we could count the barbs on his feathers! In addition to that fantastic pueo experience, we also spotted an oma'o, a common amakihi, an io (the Hawai'ian hawk), several species of plovers that we haven't identified, and a lark. All of those are quite common birds except the io, which is uncommon – we've only seen one once before, many years ago.